One of the most enjoyable and rewarding aspects of blogging is the potential to connect with others around the globe. It’s now easier than ever to “flatten your classroom walls” and learn from and with anyone, anywhere. Your class can connect with students who live on the other side of town, or the other side of the world. “Experts” can become virtual volunteers to offer students new insights and perspectives. A great way to start connecting with others is through blog posts and comments. To take the connection a step further and really enhance the relationship, the next step tends to naturally involve Skype (or similar video conferencing tools). Personally, I have always loved using Skype in my classroom and I have never met a student who didn’t get something out of the experience. In fact, after a Skype session, students generally beg for more! Being able to see and hear others just seems to spark a natural sense of curiosity and engagement. When I first began using Skype in my classroom, it was with “blogging buddies” who I’d already found a connection with. These days, you don’t even need to have a pre-established connection! 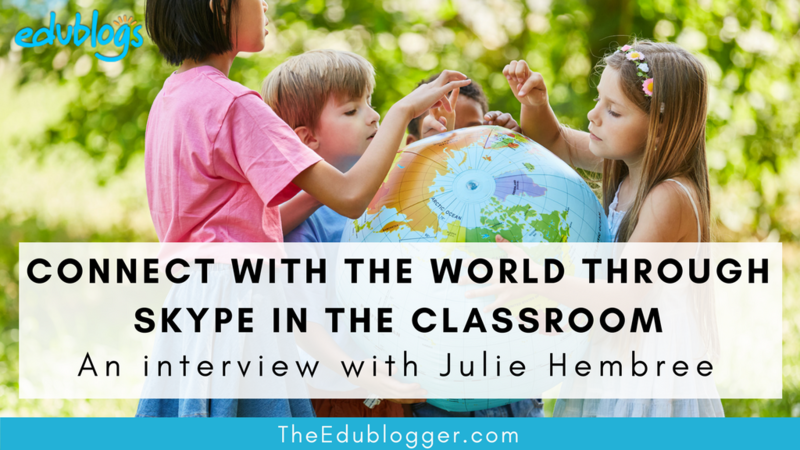 I’ve invited one of my long-term blogging buddies, Julie Hembree, to tell us more about Microsoft’s Skype in the Classroom. Her involvement with this resource is inspiring! Julie Hembree is a teacher-librarian from Washington, USA. Her blog is called Bulldog Readers and Bobcats Blog. Julie is particularly interested in literacy and global collaboration. She is a Microsoft Innovative Expert Educator, as well as a Skype and Surface Master Teacher. We asked Julie some questions to learn more about how global collaboration and Skype in the Classroom works. How did you get started in global collaboration? ​I have always had an interest in the world around me. When I first started blogging in 2010, I quickly learned that the world was literally at my fingertips. I had set my blog up with both a visitor counter showing where people were accessing my blog and a flag counter. When I started to receive comments and hits from countries around the world, I was hooked by how the use of technology could connect people. A couple years later I became part of the Microsoft Educator program and traveled to Prague for a Global Forum. Suddenly I was making connections with teachers from around the world and learning how we could help one another. My Books to Africa program was launched at this event. 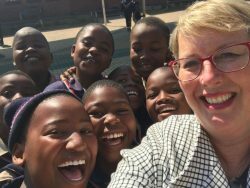 Since then my students and I have sent over 7,000 books to partner schools in Ghana, Lesotho, Nigeria, South Africa and Zambia. We Skype with one another and I have traveled to South Africa twice as a volunteer teacher. This year, a fellow MIE Tammy Dunbar and I designed a Skype Collaboration project that focused completely on global collaboration and literacy called Cultivate World Literacy. Teachers and students are learning about the issues of literacy and illiteracy on a global scale. Skype in the Classroom is an online community that enables teachers to bring the world into their classroom via Skype. Teachers can sign up for Skype in the Classroom on the Microsoft Educator website https://education.microsoft.com​ (It’s free). The most amazing part of Skype in the Classroom is the student learning. Skype breaks down the walls of the world. With just a few clicks, students can be talking with experts such as authors, scientists, engineers, or park rangers. My students have talked to park rangers in California, students in Lesotho, biologists in the North Pole, and authors from all over the country. We have traveled thousands of miles and never left the classroom! What’s the best way for a beginner to start using the features of Skype in the Classroom? 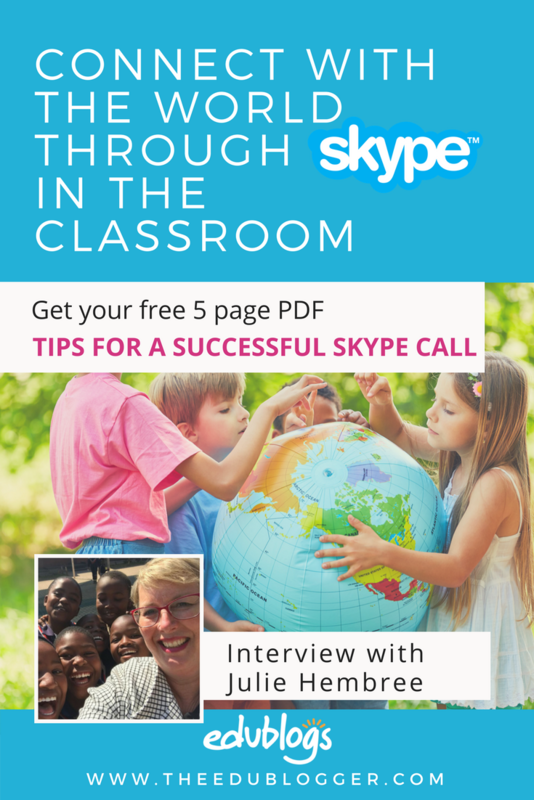 ​I think the best way to start is by reading what is available on the Skype in the Classroom website. Many teachers like to begin by playing Mystery Skype. This is a game where students try to guess where in the country or world the other classroom is located. Through Mystery Skype, I have connected with blogging buddies or friends that teach in other parts of my country. One time my students played and found out the other classroom was located in the town next door! Mystery Skype is a fun game that makes students think critically and problem solve while they’re developing their geography skills. Young students can also play Mystery Number or Animal. Often the next step is to invite subject experts to speak with the class. What are some of the benefits of global collaboration that you’ve come across? ​Global collaboration breaks down world barriers. When students talk to others a world away and discover that they share the same interests in books, sports, movies, music, or playground games, their perspective of the world changes. They learn first hand about other cultures. Digital citizenship is not just a lesson in class, it defines how they interact with other children when they are online. Budgets constraints don’t limit learning. Students don’t have to leave the classroom to speak to an expert. The experts come right into their classroom. These experiences are engaging and everyone walks away asking when they can do it again! We thank Julie for sharing this wonderful overview of what’s possible with Skype in the Classroom. If you need more information about setting up your Skype account, check out the tutorial How do I get started with Skype? Read Getting Started with Skype in the Classroom for more information for beginners. I’ve put together a guide to everything I think is important to know about having a successful Skype session in your classroom. These tips are from my own experiences with a few additions from old resources by Sue Waters, Sue Wyatt, and Anne Mirtschin. Please add your own ideas in a comment! Do you have any other tips or comments about using Skype? Leave a comment and let us know! I love the idea of skyping with elementary students from one of the many countries that my current students are from. ! I have no idea really how to establish who we would make connections with, and this would be started. I’ve always found Twitter a great place to ask for connections. Otherwise, the Skype website will help you find some matches! I think using Skype is such a great tool and the Mystery Skype activity is so neat! I think challenging the kids to think about where the other caller is would be so fun and engaging for my students. I totally agree with you. Skype is an effective tool which can be used to engage students in class. It is definitely an amazing experience for students to connect with others around the world. I was lucky enough to connect with students in Slovakia (who had been learning about different countries around the world) to share some interesting facts about my country with them. Seeing the excitement on their faces was something wonderful to see! That would have been fantastic to connect with students in Slovakia! I’m sure that’s something the students would not forget. Hope you have many more enjoyable Skype calls. That is a really good idea. Even though I’m a student. What would be some good first steps to begin a Skype session with another class over seas. I would like to collaborate with a class in Vietnam, but do not know where to begin. Great question! Julie let me know that on http://education.microsoft.com you can search for contacts by country. You can also use Twitter with a message searching for a classroom using #skypeclassroom and @microsoftedu @skypeclassroom. Hope that helps! This has always been something I thought of as both a student and a pre-service teacher. I think there is so much merit in showing your students how amazing it can be to connect with others around the world. If, as a teacher, I am lucky enough to have the chance to connect with another class or individual of a different culture or worldview, I will be sure to jump on the opportunity. So many students see school as a small room with limited opportunity. Skype can open the doors for discussing and connection with other students or mentors from anywhere in the world! I love to see such an enthusiastic pre-service teacher. I really encourage you to try out global collaboration when you get the chance. I’m sure you and your students will just love it! Good luck with your studies. Do you think that Skype is accessible to all age groups? I feel like my kindergarteners would love being able to explore different communities around the world, so is this something I could easily adapt to fit their needs? That’s a great way to interact with students with this great technology in classrooms. Skype is the next level in the modern day teaching. This interaction will create wonders in student’s life. And also these digital tools improve teaching and learning experience by students. Not all of them have updated to this new technology but will definitely they will implement it in future. Thanks for updating it in blog. It’s a nice article. So glad you enjoyed! Unfortunately some parts of the world still do have trouble accessing this sort of technology but let’s hope that changes rapidly! Classrooms in many countries, especially the under- developed countries lack adequate facilities for e-learning. It is quite a challenge! You are a real role model with the way you use Skype to connect with all corners of the world. I’d love to know if you have any tips for finding classes to Skype with in more remote locations? I’m sure others would love to hear too! Thanks for sharing these resources. We have not started using SKYPE in my school but we are thinking of collaborating online. We will try it in the future. Thanks for commenting, Tiziana. Good luck with your skyping adventures!